Witamy! Welcome to the 305 Squadron Living History Group website. 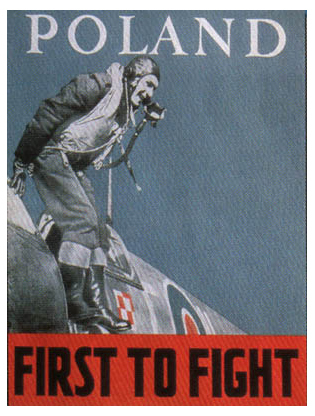 We are a member unit of the WWII Polish Living History Group which is dedicated to educating the public about the deeds of the armed forces of Poland during the Second World War. Our goal in 305 Sqaudron is to honor and preserve the history of the PAF (Polish Air Force) that served in exile from 1939-1945. We attend various living history events and air shows throughout the course of each year. We focus on portraying 305 Polish Bomber Squadron, but, depending on the event, we can represent any of the other 14 PAF Squadrons (15 squadrons total) that served in exile. "A Crew from 305 SQUADRON being briefed before a mission"
"305 SQUADRON ready to take their Mosquito bomber on a run"
Pictured from L to R: C. Moore, J. Duda, C. Petronis, and R. Holliday. "Mini-Replika" (Polish Magazine) Article About "Our 305 Sqdrn"
"305 Dywizjon Bombowy Ziemi Wielkopolskiej im. Marszalka Jozefa Pilsudskiego"
Julian Wielgosz (Polish Air Force).